Trick or Treat? We have a spooky treat for you this Halloween. 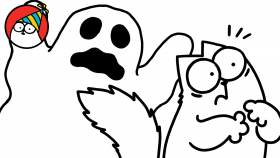 Look out for Simon’s Cat creeping around in this Halloween 360 video special! Spot how many times you can see Simon’s Cat! If you liked this video you might want to check out our other 360 video. Try and follow Simon’s Cat around Simon’s living room. Beware! He is sneaky. Drag your mouse or tilt your phone to explore the room.